Early-bird (all 3 days of talks) : sold out! All 3 days of talks : sold out! Talks, Saturday May 21 : sold out! Talks, Sunday May 22 : sold out! The exhibition will be free and open to the public! More details later via mailing list. alt-AI was hosted at SFPC and organized by Lauren Gardner and Gene Kogan. We are located in 155 Bank street, NYC. 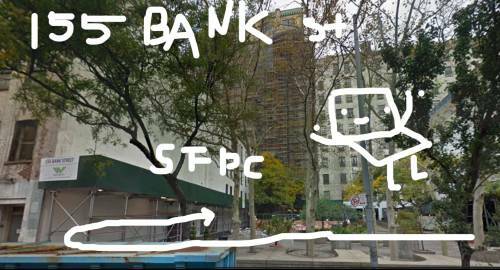 It’s about 10 minutes walking distance from 14th street [A,C,L] and Christopher st  subway stations. On Bank street, pass the New School for Drama. 155 Bank street is part of the WestBeth. There are scaffolding and fence in the courtyard. 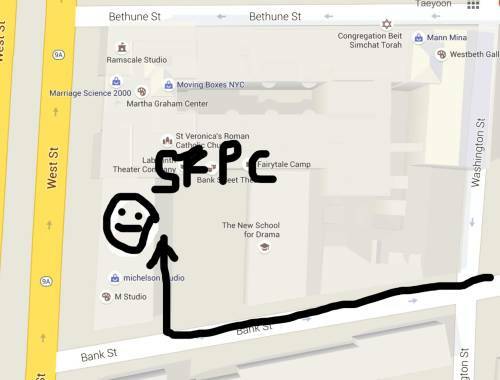 Walk to the west end of the courtyard and follow the arrow, pass the Michelson studio and find SFPC sign. There’s a giant window and projection that will be screening students work. Walk through a door and you will see our space. We are on the ground floor. The exhibition will be free and open to the public! More details will be announced via mailing list. Have you ever wanted to build a new musical instrument that responded to your gestures by making sound? Or create live visuals to accompany a dancer? Or create an interactive art installation that reacts to the movements or actions of an audience? If so, take this course! In this course, students will learn fundamental machine learning techniques that can be used to make sense of human gesture, musical audio, and other real-time data. The focus will be on learning about algorithms, software tools, and best practices that can be immediately employed in creating new real-time systems in the arts. Machine learning provides techniques that allow us to "reverse engineer" both natural and artificial phenomena in order to uncover their underlying processes. Given the ubiquity of black-box algorithmic control in society, the latter type of phenomena is probably more deserving of reverse engineering. In this workshop, the fundamental mindset and basic techniques of machine learning will be introduced through a narrative of a totally surveilled and quantified society based on the show Psycho-Pass and anxieties around programs like Sesame Credit. You'll learn how to think about the world in the "machine learning" way - from an intuitive mathematical perspective - and use popular Python programs to apply this new thinking to just about anything. This class will introduce techniques for analyzing, organizing, and visualizing high-dimensional data in 2D. Case examples will include gridding a collection of images pre-analyzed by a neural network (in openFrameworks and python), and clustering Wikipedia articles based on content analysis (in python). In the process of generating these, we will introduce convolutional neural networks, tf-idf matrices for text processing, and the t-SNE dimensionality reduction algorithm. See here and here for example projects. We will have some number of electronic displays, courtesy of openframe. Animated, web-based, and various other media can be proposed for these. Still images will either be shown on the displays, or printed. Installation or performance proposals are welcome, to the extent we'll have the space and means of accommodating them. Entries should have some connection to AI, machine learning, and adjacent fields. We take a broad view of the term. Entries can be changed at any time. Submit a proposal here. alt-AI is over! Watch the talks and highlight videos here. alt-AI explores artificial intelligence through the lens of artistic practice. What role can artists, writers, coders, and curators play in mediating scientific research to the public? How do we critically examine the implications, artifacts, and applications that follow? If you would like to support the conference, please contact us. Thank you to Spotify for their generous donation.